Nature’s oldest waterpark rises from the ground like a glacial wonderland with water flowing into an endless series of gleaming white, terraced basins. Scattered about lie the ruins of an ancient civilization, the 2nd century B.C. dynasty of Attalids, forming a surreal backdrop to this seemingly arctic landscape. But this world wonder is anything but frozen. This is Pamukkale in southwest Turkey, where the water flows from a hot spring. And the formation isn’t made of ice: it’s solid calcium. Not the milk kind of calcium but a mineral called calcium carbonate that’s white and smooth. An underground fault pumps out hot mineral water, and as the water reaches the surface, a chemical reaction takes place. Carbon dioxide is released into the air, leaving behind bits of calcium carbonate minerals that are deposited as the water flows down the slope. Deposits are a bit soft at first, but cool into a shelf of a solid, white limestone called travertine. As more water flows: more travertine shelves are built. Before long, there’s a whole hillside of terraced pools stacked one on top of another. The watery wonderland is a year-round destination. Even in winter, the hot springs maintain a soothing 65 degrees Fahrenheit (18.3 degrees Celsius), attracting hoards of people who come for an afternoon dip. Yes, the world has been in on the secret for centuries. Ancient Romans constructed canals to harness the springs for a spa city they built nearby called Hierapolis. They believed the waters had medicinal or beautifying properties. 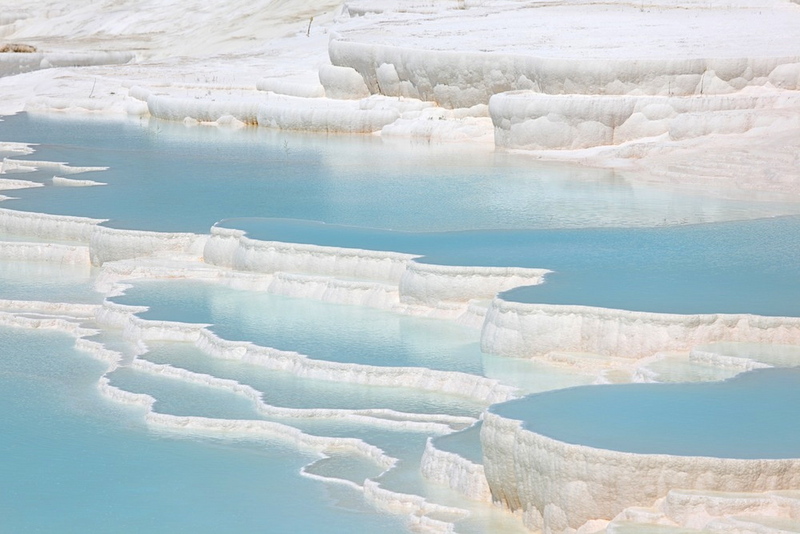 We can’t say for sure if there are any health or beauty benefits to lounging in the terraced pools of Pamukkale, but we wouldn’t mind finding out.